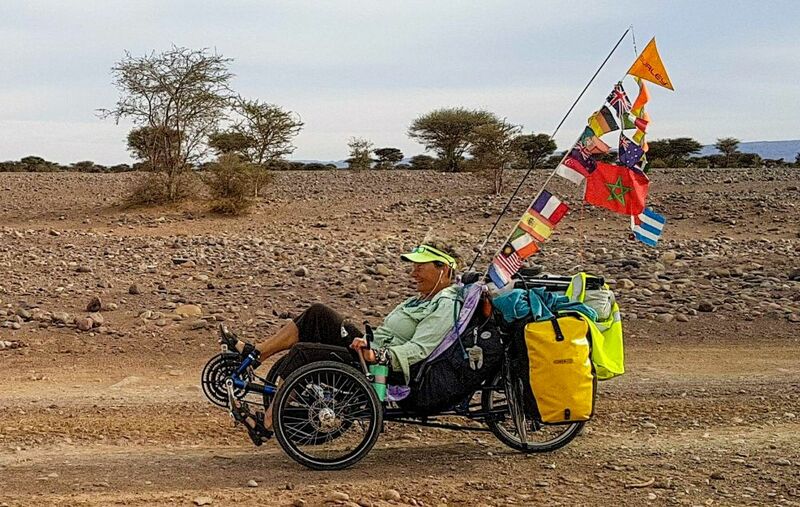 Every cyclist is unique and has different needs and preferences and therefore may develop their own tricks for making life easier while touring the planet. A pee rag for a woman. I carry a bandana that I use for this purpose and it saves on toilet paper (which is always in short supply). I tie the rag on the back of my trike during the day so it’s easily handy. 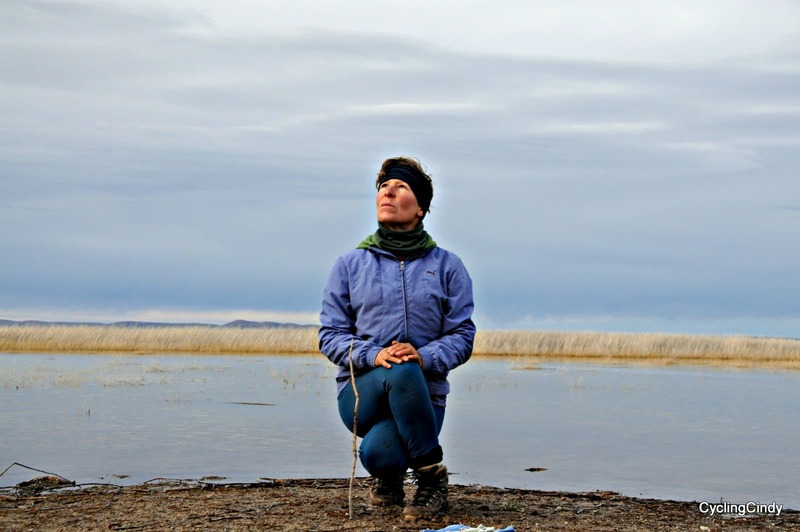 At night I use a pee jar (350ml or 1.5 cups) that I keep just outside my tent with my pee rag. This way I don’t have to go out at night or better yet, when it’s raining. In the morning I put a drop of liquid soap and a bit of water in the pee jar, pop on the lid, and shake. This keeps it from smelling. When the pee rag needs a wash I stuff it in the fresh pee jar and add soap and water and shake. Because I often camp in parks where I can’t dig a cat hole for pooping, I’ve perfected a method for pooping in my tent into a plastic bag without fear of making a mess. Top right: silicone bread pan I line with a produce plastic bag for pooping. The rock represents poop. 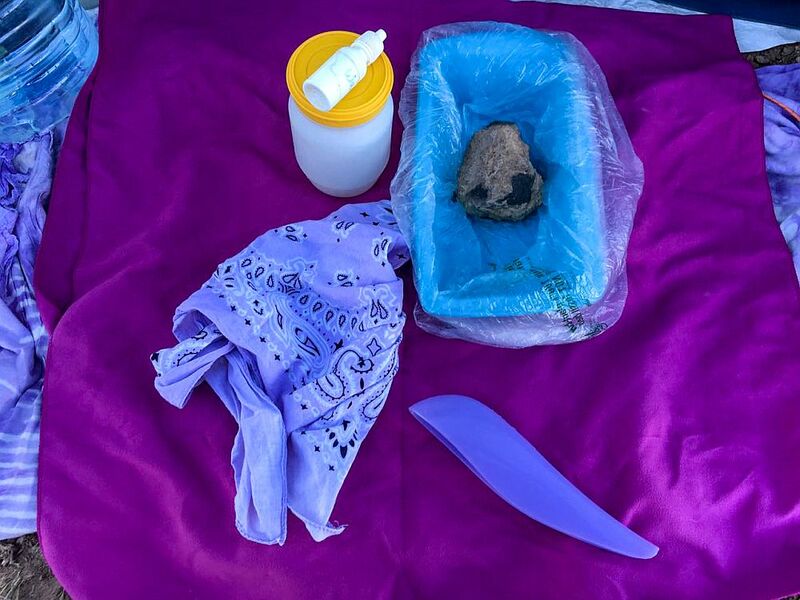 Then a P Style, feminine peeing tool; pee rag; and pee jar with yellow lid and small container of liquid soap on top. I’ve also used my pot and plastic bag when I didn’t have the silicone bread pan. I am using my “pee buddy” when there’s traffic and can’t drop my pants. I want to be sure my sleeping bag and clothes stay absolutely dry so I put a large plastic bag in my panniers. The sacks are trash compactor bags sold in the USA. A sturdy trash bag would work too. This way my sleeping bag and clothes are snug and dry and separate from my toiletries which might leak. I also found it helpful in my food pannier because moisture in there causes the cloth pocket to mold. It’s also easier to clean or replace. Another thing I do for comfort sleeping because I have hot flashes and a broken thermostat is I carry 2 sleeping bags: a 0* C (30* F) and a 10* C (50*F). Whichever bag I’m not using I stuff into a pillowcase (or a stuff sack) and use as a pillow. I often switch bags as the night gets colder. And if it’s really cold I use both. I must explain that I rarely zip up a sleeping bag. I use them like a quilt. I also have made a fabric case for my air pad that I slip it in each night so I can sleep on a bottom sheet and keep the pad cleaner. I’m quite comfy!! 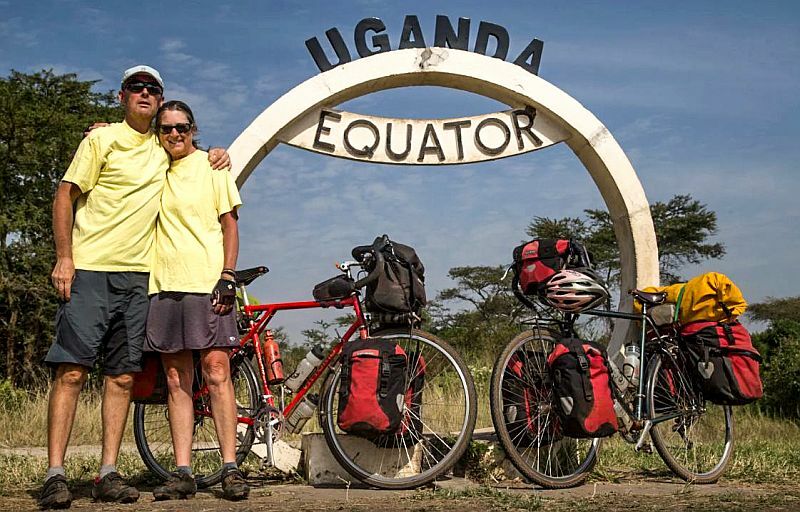 At the very beginning of our trip we discovered, that our handlebar bags were bouncing quite a lot, due to the fact that there is only one attachment. So we added an additional fixing point, to remove some of the force from the original attachment. 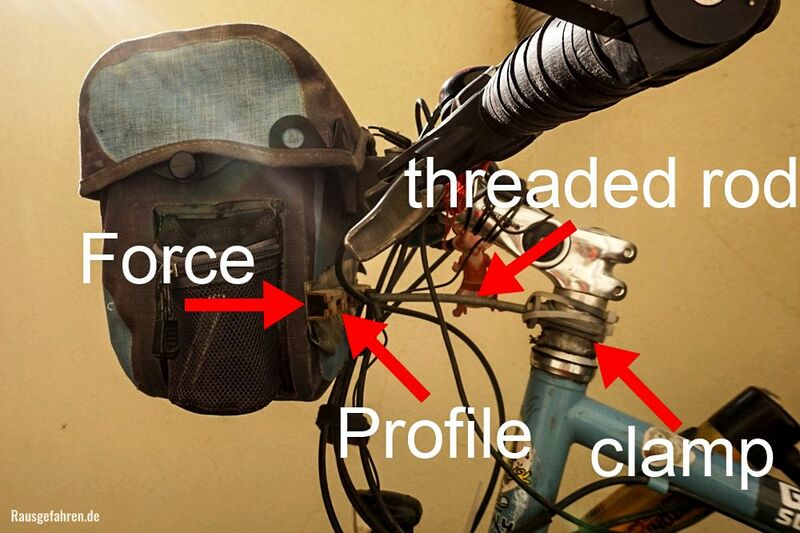 This is quite easy: We just took a threaded rod, a clamp in the size of the steerer tube and an aluminum profile rod. Then you attach the clamp to the steerer tube, maybe with the help of some cable ties. Check which length the threaded rod has to be and then attach it to the profile with two nuts – Done. Now the most pressure which resulted of the momentum of the bag, is absorbed by this additional fixing point. 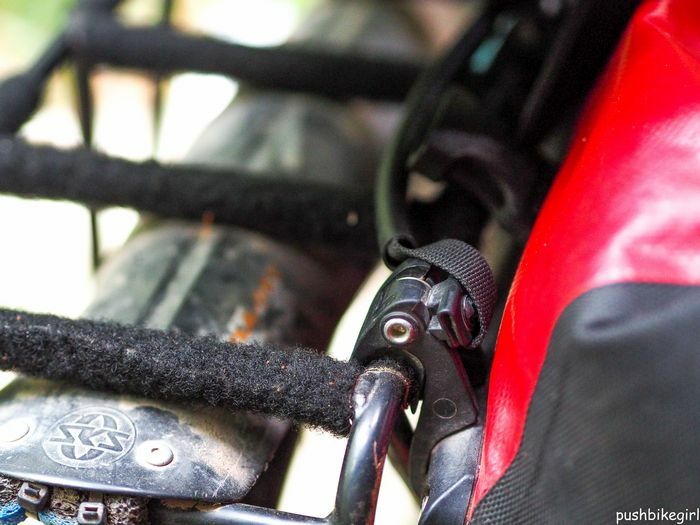 With this adjustment you can also put heavier stuff in your handlebar bag! Make sure to call the airline and ask them about bicycle transportation before you book your ticket. We met quite a lot of people who had problems with the airline because the regulations were not explicit. 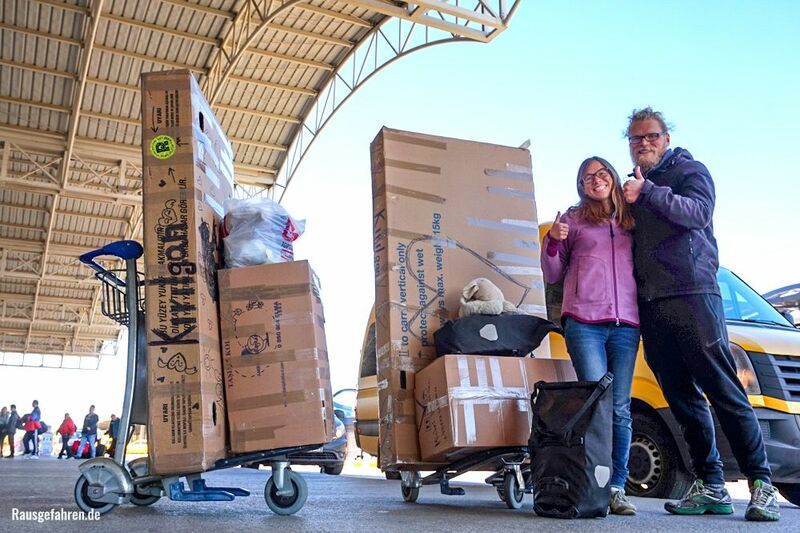 Call them and ask that they should send you an email with the allowed size, weight, necessary packaging and what it will cost to transport your bike. Print this mail and show it at the airport to avoid long discussions. Almost all the people we met, had a very twisted windshield or it was already broken, because every day it was bent to put it into the panniers. 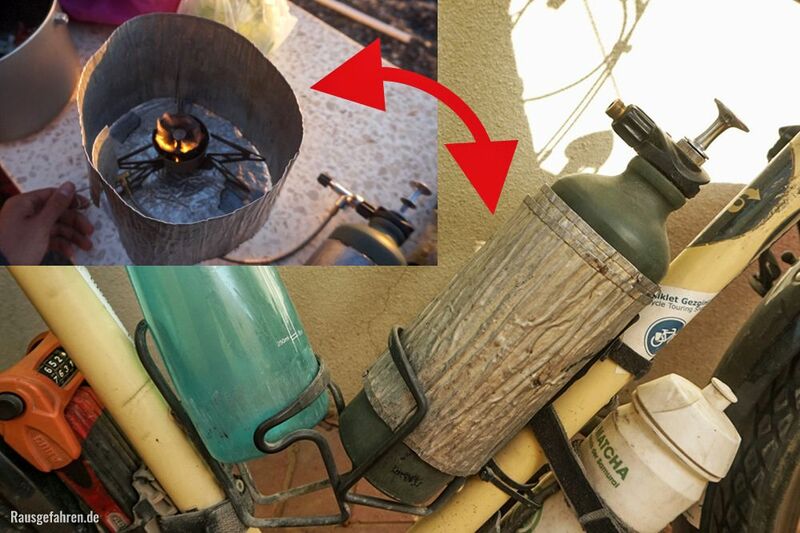 Here is the much better solution: Just wrap it around your petrol bottle and it will always stay in the right shape and will last for years. 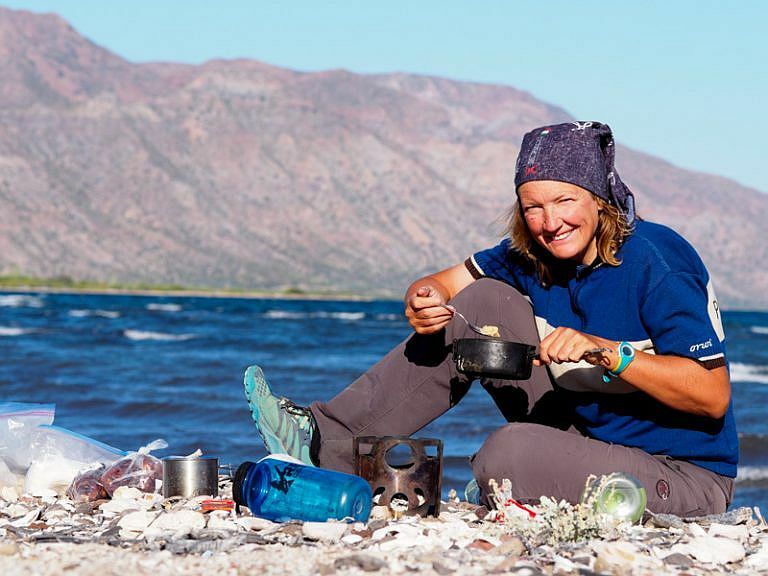 Cindy gave me an interview a few years back and told me in another article about her way of preparing meals on the road. #7 Selfies – When preparing for a selfie, use an object to focus on. A selfie requires practice. I hardly ever use automatic focus because I want depth in my photographs. Upon deciding that I am the main subject, I cannot focus on myself since I am the one who needs to set the shutter-speed, lens opening and timing of the camera, thus I am not there to focus on. 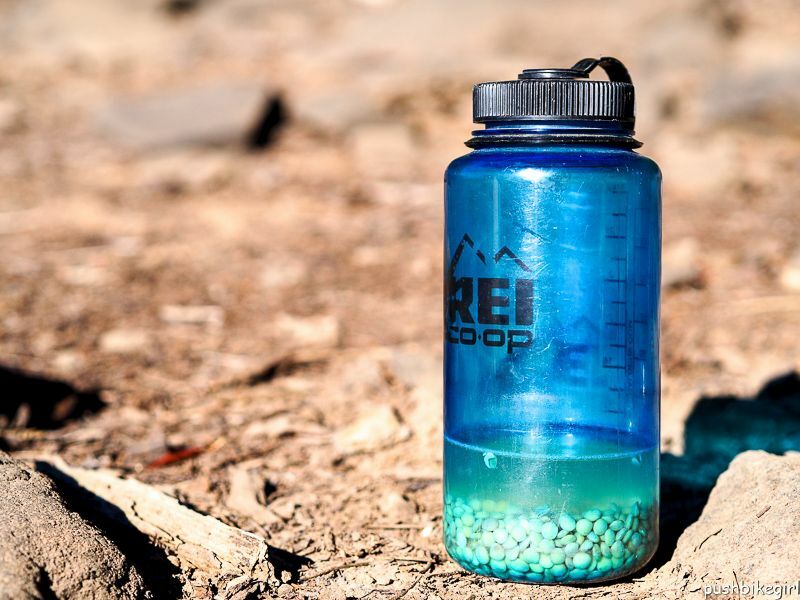 I use a stone, stick or water-bottle to replace myself. After setting the timer and pressing the shutter button I remove the object I focused on and place myself at the exact same spot. 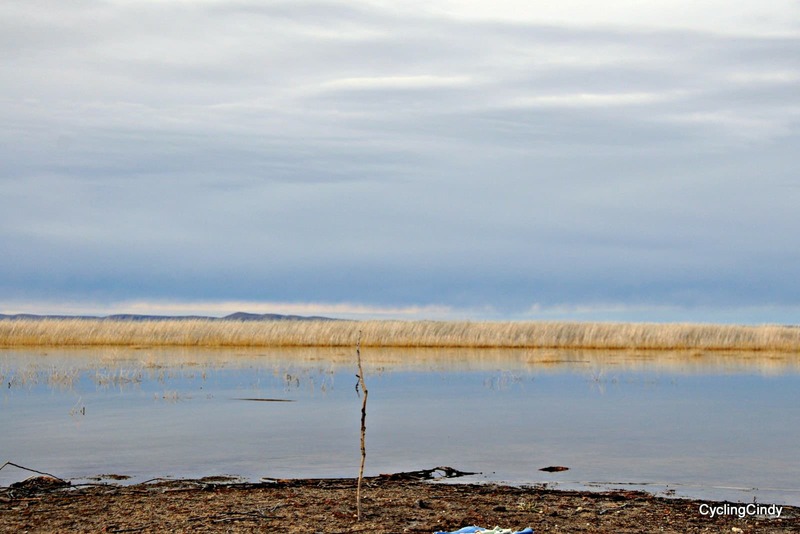 I find it a good idea to stop often for photos, as this enables you to focus on the surroundings. Placing yourself in the photo also gives a very different perspective of the place you are in. #8 In need of water? Even in the desert it is possible to find enough water. Often there is water at the little chapels set up for deadly road accidents or prayer sites. Bottles bump out of the open pickups and oftentimes, bottles fall out when truck drivers open their doors. So, skirting along truck stops can be a good source for full bottles of water (just make sure it is not diluted, or pure urine!). 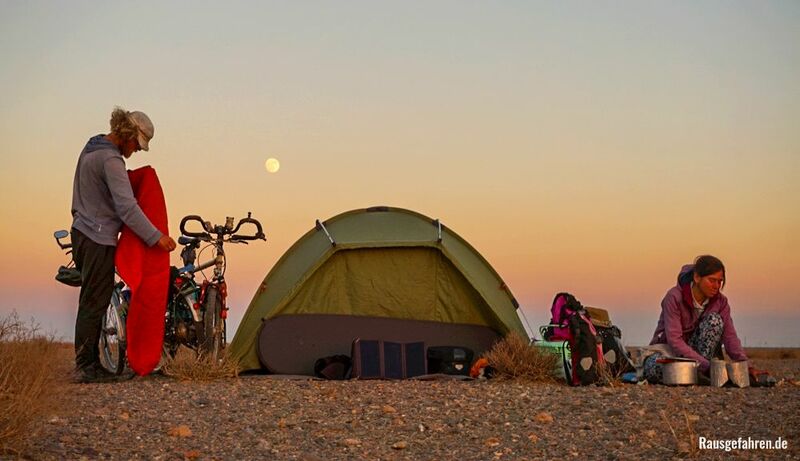 #9 Camping – upon finding a place to camp, be sure to make a mental note for returning to your route in the morning. This may sound logical and you may be thinking I am not the most intelligent person, but the fact is that the openness of nature can easily overwhelm you, and you may start jumping for joy, crisscrossing your bicycle in all directions, out of sheer enthusiasm. You are now so happy, simply because on your left are endless possibilities to camp, but to your right are even more options, not to speak of what is in front of you! So, my advice is simple here, without losing sight of your bicycle, find a place by foot and return with the bicycle. Follow the tire tracks back in the morning. This should prevent you from not being able to go back exactly the way you came in. To leave the same way has the benefit that you probably chose the easiest way coming in, so you won’t be faced with obstacles like boulders, streams, puncture risks, closed fences or even getting lost. 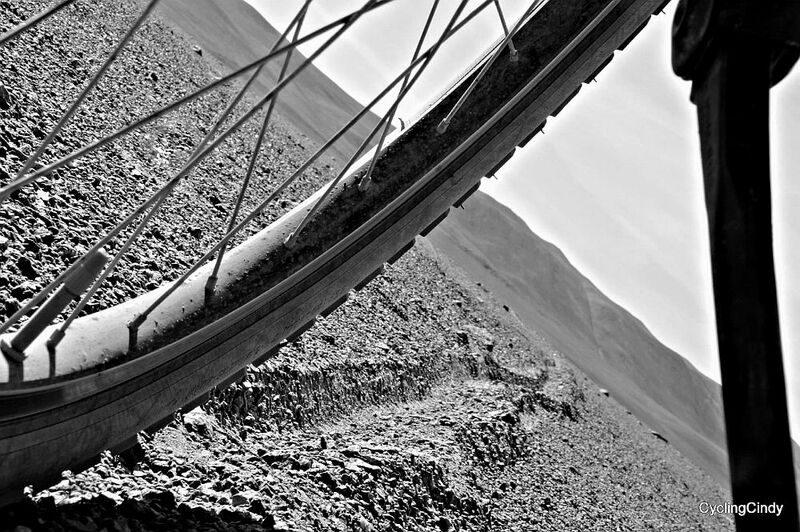 The tracks of your bicycle leave better impressions on the ground than your footsteps. Desert surroundings may not appear to be difficult to emerge from, but there may not be many points of reference. So again, being able to follow that one set of tire tracks out in the morning is a handy trick. 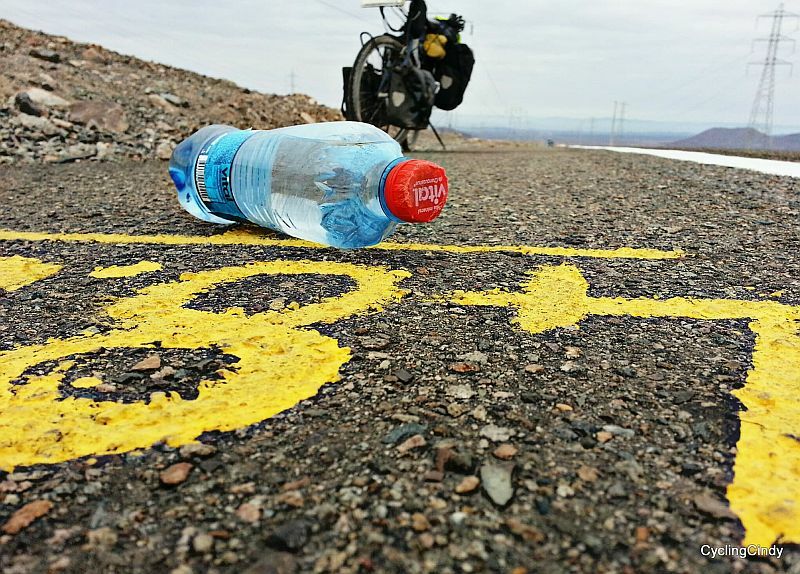 Cycling in South America is pretty much cycling between fences. The Andes and Atacama are exceptions but all else is fenced, big time! 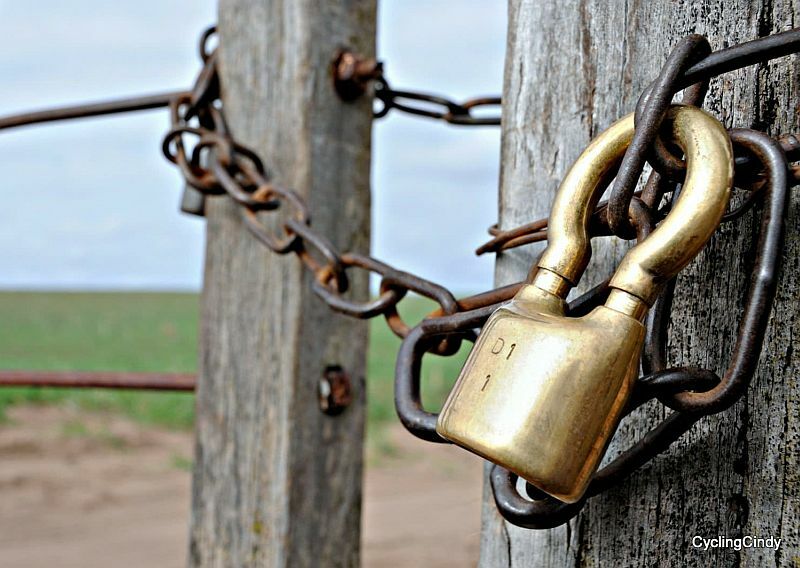 Of course, if you learn to trespass quickly you will be successful and it helps when you start to focus on closed gates. 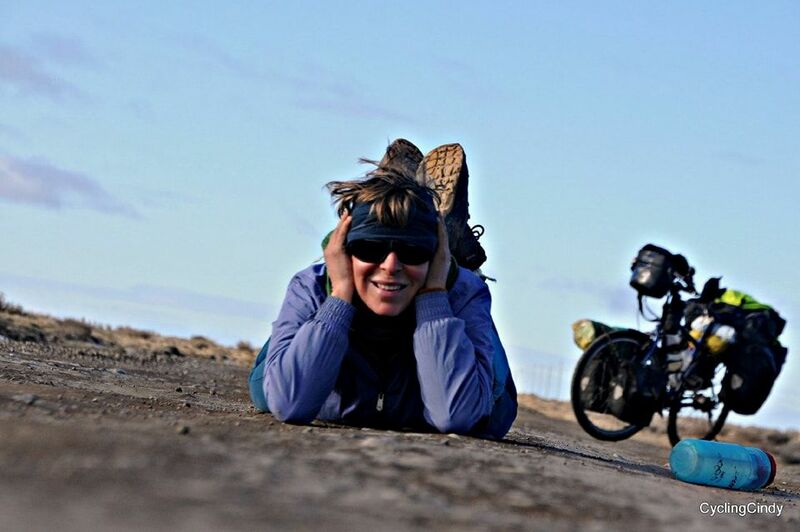 It is annoying to end a tiresome day by having to get your bike and all your gear over or under a barb-wire fence. Sometimes I even had to loosen and turn the handlebars to get the bike through. Learn to read the gates, as quite often they are not really locked. 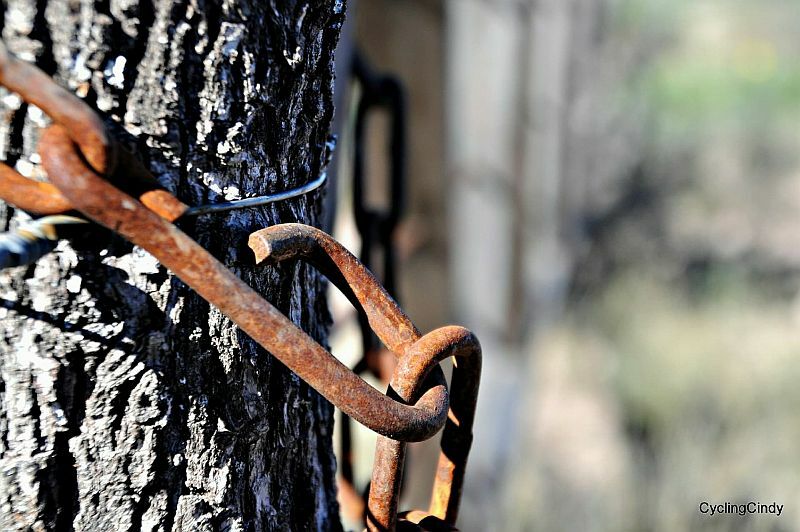 They may appear to be locked, but the chain may simply be wrapped around to give that impression and sometimes there is only a hook. Other times the lock is not pressed closed and remains open. It’s a good idea to leave it as you found it. In many countries you can ask directions by pointing your finger in the direction you assume is the correct way, wanting confirmation. You can ask for things by making sentences by which other people can reply with ‘yes’ and ‘no’. But often people do not understand your newly learned language skills, nor your accent, nor your mother-tongue. When I want to have genuine answers to the directions I ask, I am also aware that many folks do not want to let you down, so they just answer something. As a ‘I don’t know’ for an answer is rather disrespectful for them. Asking your questions in such a way that there is no possibility to answer with a ‘yes’ or ‘no’, is the best way to find out where it is that you want to go. In India you need to do this trick at least three times at the same spot, as most votes count here. In Iran I did not want to camp as I was harassed on a daily basis, so I chose the safety of family houses. Knowing how extremely hospitable the Iranians are I did not want to ask bluntly whether they had a place for me to sleep, instead I would ask where there was a mosque to sleep at, or whether they would allow me to camp next to their house. They would ALWAYS invite me in. In Iran do not seek places to sleep at police stations, firefighters nor any other public place where only men work. As a single woman they cannot (easily) accommodate you. To keep the bags cleaner, we take two twin sheets and sew snaps on the bottom. 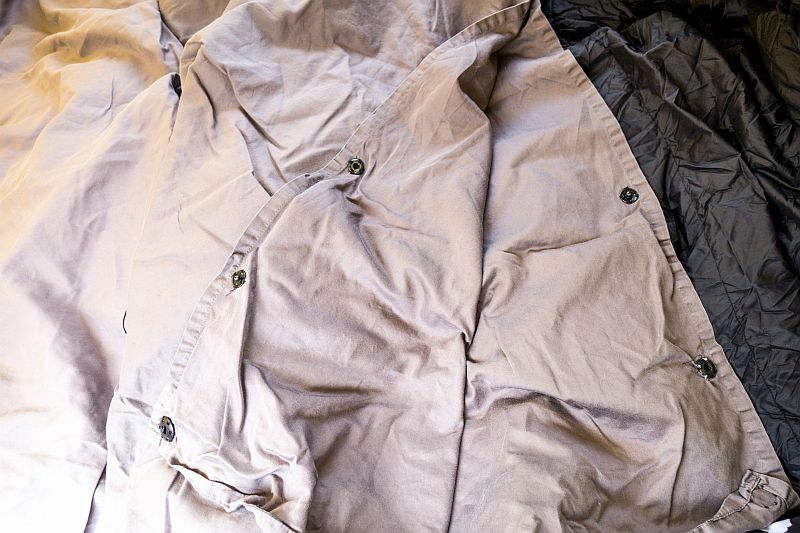 This keeps them like a sleeping sack, the sides are open to easily get out of, and unsnapped easier to wash and hang on a line to dry. The advantage of the sheets also is for use in hostels or hotels where the sheets are dodgy. 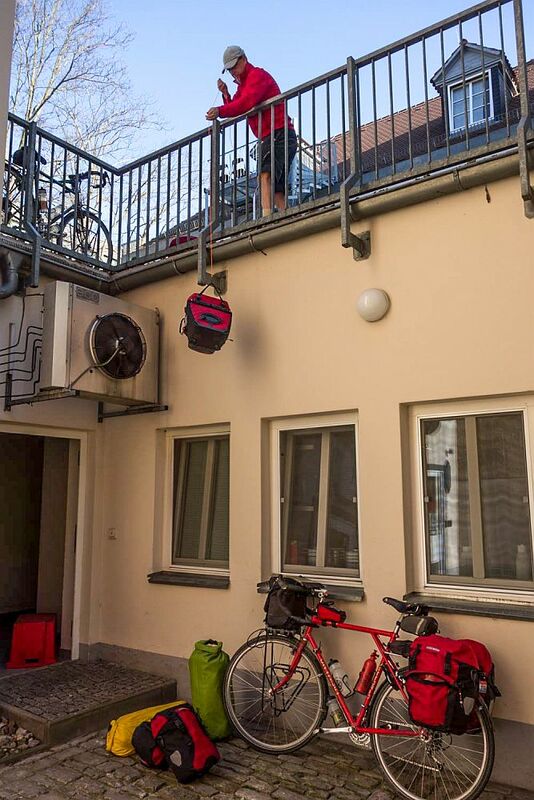 Our clothes line with a carabiner can do double duty under certain conditions to raise or lower bags from upper floors instead of carrying gear up and down stairs. 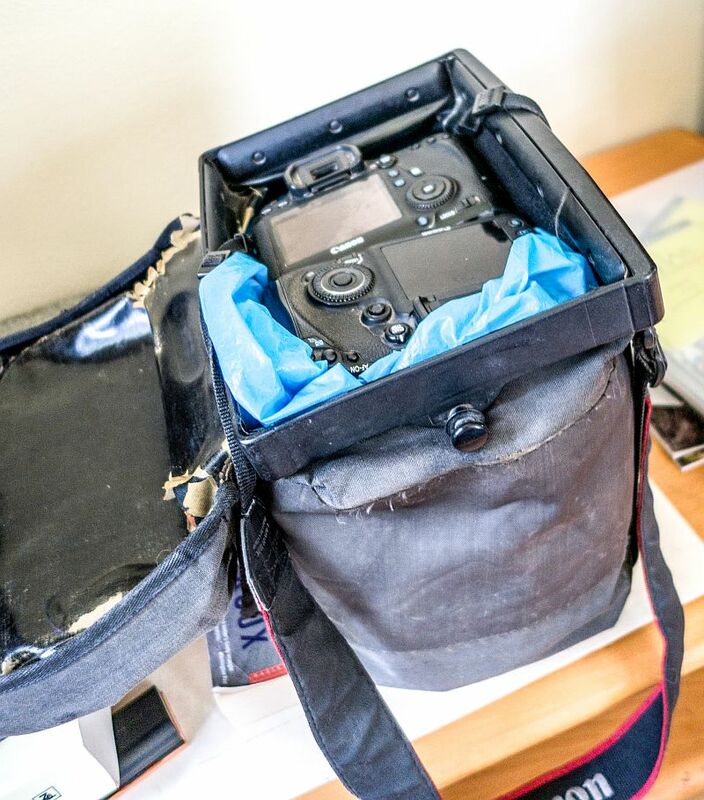 One trick Patrick did for his camera gear was having the Ortlieb handlebar bag deepened. 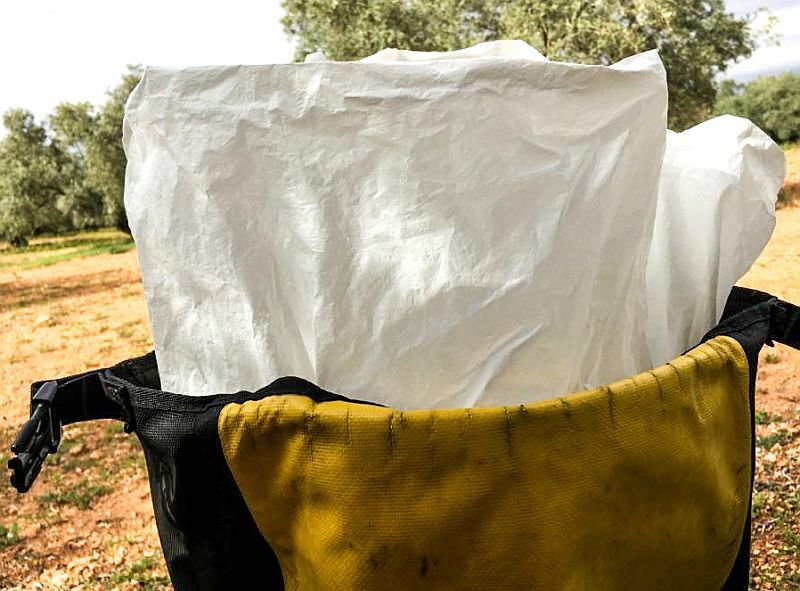 He took the bag to a raft maker who cut the bag and glued raft material in the section that lengthened the bag. Patrick then created a foam insert for his two cameras, one with a wide-angle lens and one with a telephoto lens. He then could pull the camera with the lens for the picture he wanted to take. The advantage of having this setup is not having to change lenses which increases the chance of the lens getting dirty and not missing the shot. 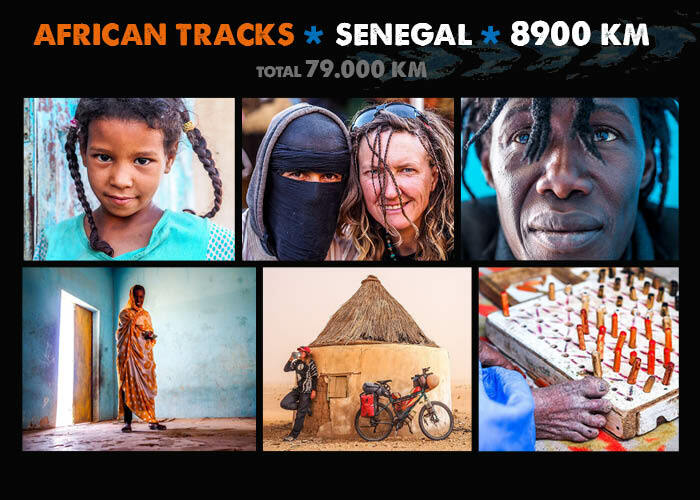 I cycled a total of 70.000 KM in 52 countries within 6 years. Beans and lentils are healthy and filling and easy to carry but they take a long time to cook. Best is to soak them in water for a while. 24 hours for beans, 12 hours for lentils. Never use salt when cooking – only add it when they are done. Rather than waiting for the water to boil I add my pasta or rice right at the start to save fuel. By the time it is boiling I turn off the stove and set the covered pot aside to let the pasta finish cooking. If I am near the sea I use salt water for cooking pasta to save drinking water and salt. You might have to add some fresh water to it otherwise it can be a bit too salty. When in countries where I don’t speak the language, I write a note with the help of a local where I introduce myself and explain that I am touring the world. In this note I ask for a safe place for the night and hardly ever get rejected. I found laying out my world map and showing where I am from and where I have been, to be a good icebreaker when invited into someone’s home. 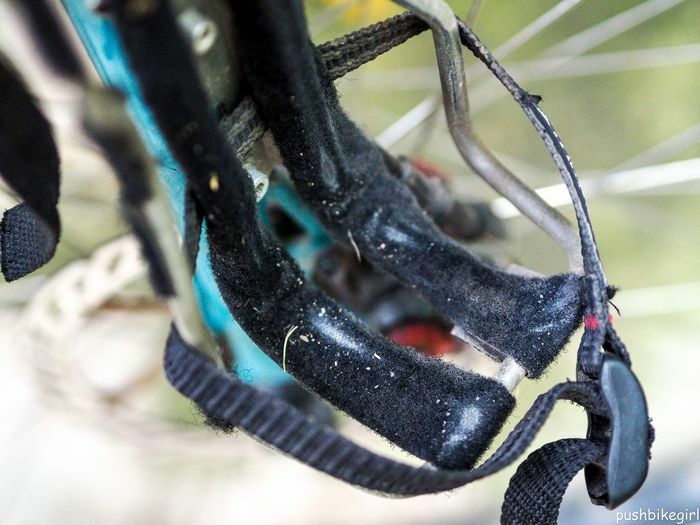 Velcro proved to be of great help in stopping rattles and wear and tear on panniers & bags. Strategically applying Velcro to my racks & water cages. Tree sap is a good fire starter. Watch out for it while cycling through the forest. 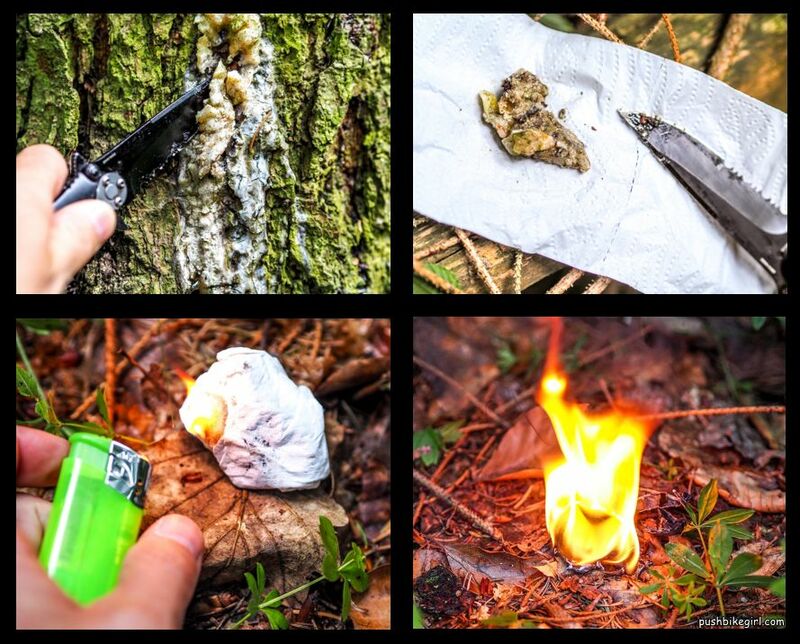 Simply collect it with your knife, wrap it in paper and light up the little package to start the fire. Tree sap burns very well and last for several minutes. Do you have any tricks you would like to share? Feel free to add them in the comments below. Hey Heike, thanks for another interesting post. I always enjoy your post and also like the ones where you gather the opinions and experiences of other long term travelers. I have a couple new tricks now to try out when I get back on the road again. Hope you are having a good break at home and am looking forward to what your future holds. 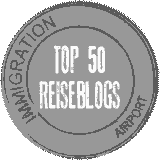 Hallo Heike, thanks for this exzellent collection of travel experiences..
Hi Thomas, thanks for the compliment! Didn’t try to light up birch bark yet. Will do so next time I am in the woods. Hi Heike, there are some some great tips in there that i haven’t thought of. I like your solution to Iran accommodation. It would work in many places I expect. I would add an extra element for your toilet tip. I have only used this one but i felt much happier doing it. I had to poo in a plastic bag once and then carry it along with me some way. I put leaves in the bag so that my droppings were completely wrapped in it and not getting all over the plastic. I think it also minimised the smell. That said, i am not keen on having to go inside my tent. I guess when you have to youll do it. Never heard about tree sap before. That’s an excellent tip. 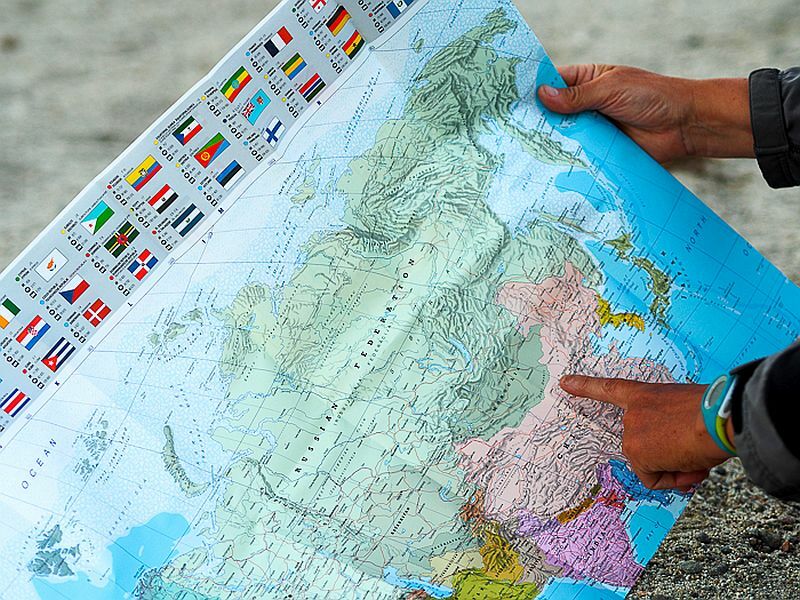 Re the map tip, while it may be great in many situations, there are many people in the world who have no idea how to read a map. In india ordinary people you meet along the way usually don’t know how to read maps. Hi Andrea, thanks very much for your feedback and thoughts. Yes the map tip doesn’t always work. But I was surprised that even in the remotest areas where people can hardly read in general, they were interested to find out more about who I am and who their neighbour countries are. Great & useful tips! Thnx. 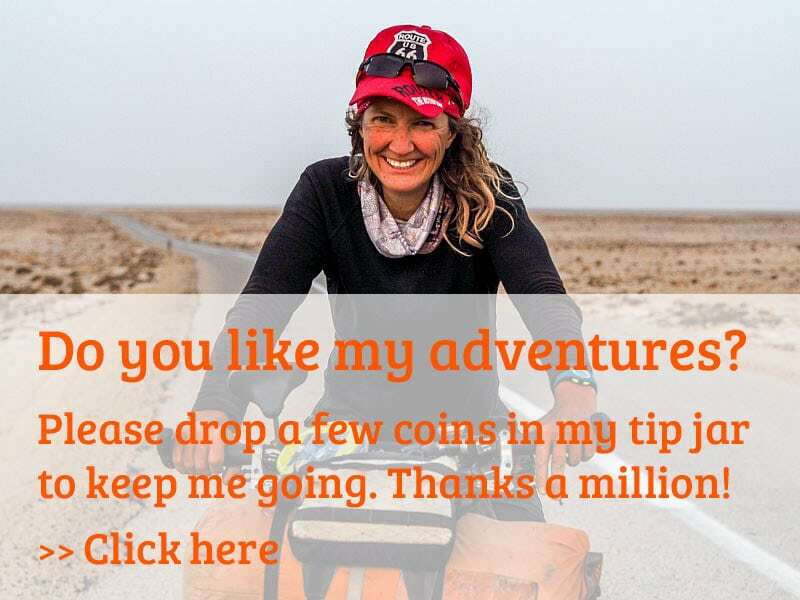 If you are riding in developed countries you might not need cooking equipment stove etc as you can buy food along the way each day as you ride. I took stove etc to Taiwan for one month. Waste of time and weight as I never used it as food is plentiful, wide variety of styles, tasty, good quality and most importantly cheap. yes food in Taiwan is great and very cheap! 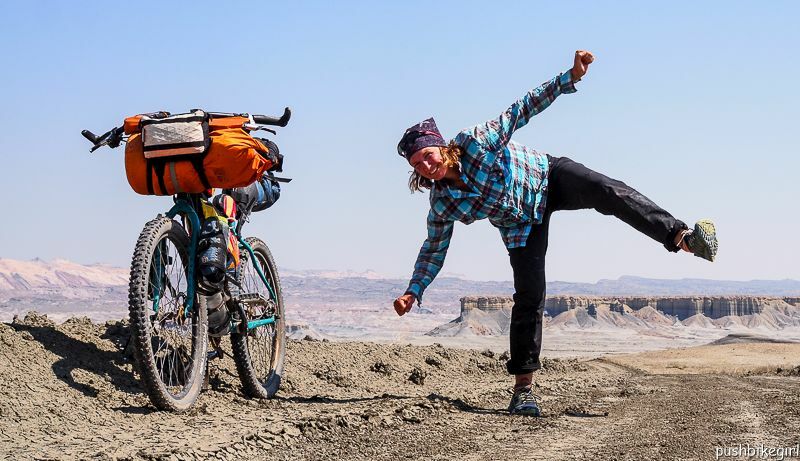 And I never cooked there myself either….but bike touring in several countries or even around the world makes it hard to reduce weight because you might need the gear you left behind for Taiwan for the next country on your journey. I am not Alex. But I can add my two cents to it. Taiwan is more expensive than Thailand. But you can always find cheap little places to eat. I hardly ever used my cooking gear. The food is super tasty. Thank you for your thoughts. ? Liebe diesen Post, Danke Heike und allen Anderen. Loved the idea for the stove windshield! On tour, we couldn’t do without a good supply of ponytail bands – the nice ones without the metal join. We use them for so many things – securing open bags of food, stopping rolled up things from unrolling (e.g. 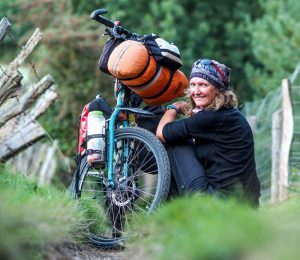 rain jacket & leggings), binding loose things together, stopping the fuel bottle from rattling, securing the neck of a PET bottle that is too long for the carrier, lightweight attachments in the tent, keeping your socks up, using different colours to tag which pannier is which. And many other uses! There’s always a number of them wrapped around my bar-bag mount. Perfect idea Lesley – thanks for sharing! Hi, regarding #20 I can recommend to use Velox rim tape to protect racks from being damaged by rattling Ortlieb bags 🙂 I put another layer of black gaffer tape on top of it. Some good info. here, especially Kathryn’s toilet tips. I’ve got a tip to add. Almost every cyclist carries electronics such as a smartphone, camera, etc. and cables to recharge them. In one guesthouse, we accidentally left our black recharging cable behind. We just thought it was the hotel’s telephone cord. Since then, we wrap a piece of bright red duct tape onto all of our electrical cords so we can recognize them as being ours. Now they’re so much easier to spot. I’ve also heard of a guy who put a bit of red paint on the top of all of his tent stakes after he once left one behind. 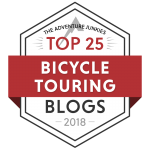 Thanks Grace for your interesting tips….always helpful to get ideas from other bicycle travellers…..
Aaaah so much good stuff here. Thank you Heike and everyone. I keep an old cloth for cleaning my chain and anything else greasy. When it is really dirty I just rip off a section and use it to start a fire. It burns nice and hot so is good to start bigger wood pieces. Same for cleaning greasy cooking gear – use toilet paper to get most of the fatty grease off and later use it to start a fire. Grease and oil has a lot of energy in it so it burns for quite a while with a hot flame and it disposes of polluting rubbish.